On 28 November 2015, Tahir Elçi, a prominent Kurdish human rights lawyer, was shot and killed during a press conference in the city of Diyarbakır in south-east Turkey. Elçi had been a figure of international renown, and a leading advocate for human rights in the context of Turkey’s decades-long conflict with the Kurdistan Workers’ Party (PKK). He fought and won landmark cases at the European Court of Human Rights, defending the rights of victims of civilian massacres, displacements and extrajudicial executions. Thousands lined the streets of Diyarbakır at his funeral. At the press conference, Elçi had appealed for calm in the city, amid a recent wave of violence. The weeks and months following his death, however, saw an escalation in the conflict that resulted in the near-total destruction of Diyarbakır’s historic centre, the deaths of hundreds of civilians and the displacement of thousands more. Despite Prime Minister Ahmet Davutoğlu’s promise that the attackers would be brought to justice, no one has ever been charged with the killing. In 2016, with the official investigation stalled, the Diyarbakır Bar Association – of which Elçi was chairman at the time of his death – asked Forensic Architecture to independently examine the evidence shared with them by the public prosecutor. Our investigation has identified the individuals who should be treated as suspects in the case. These findings underscore the need for Turkish authorities to launch a new and effective inquiry into the circumstances of Elçi’s death. On 14 December 2018, the Bar Association submitted our report to the state’s investigators. You can watch the video investigation in full above, read in detail about our methodology here, or read on for further context about the killing, and our investigation. The conflict between Turkey’s security forces and the PKK has endured since the 1980s. It has claimed more than 40,000 lives, and during the 1990s alone displaced more than two million people. By late 2015, a major peace process had collapsed, spawning a new episode of the conflict. Members of an armed youth wing of the PKK, known as the YDG-H, entrenched themselves in urban districts across Turkey’s Kurdish-populated south-east region, declaring them liberated, autonomous zones. 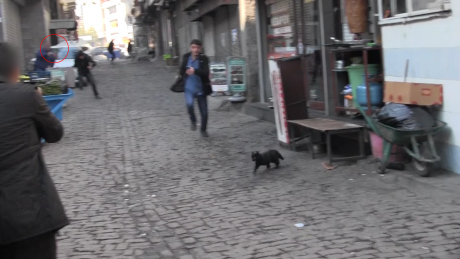 These areas, among them Diyarbakır’s historic district of Sur, became the site of intensifying clashes. The barricades that surrounded the YDG-H-controlled zone in Sur ran close to the city’s most famous historic monument, the Four-legged Minaret of the sixteenth-century Sheikh Matar mosque. The mosque, and its minaret, stand on the periphery of a UNESCO World Heritage site. On 26 November 2015, two days before Elçi was killed, the legs of the minaret were damaged during clashes between the YDG-H and local police. The next day, Elçi tweeted a photograph of the minaret, scarred by bullet holes. On 28 November, Elçi held a press conference, at which he decried the arrival of conflict in the city and the destruction of its cultural heritage, and called for an immediate end to the armed clashes in the historic district. &amp;amp;amp;amp;amp;amp;amp;amp;amp;amp;amp;lt;/p&amp;amp;amp;amp;amp;amp;amp;amp;amp;amp;amp;gt;Tahir Elçi speaking at his press conference outside the Sheikh Matar mosque moments before he was shot. Yet even as Elçi denounced the ongoing violence, an incident was unfolding nearby that would lead to his death. On the adjacent Gazi Avenue, two members of the YDG-H shot and killed two policemen who approached the taxi in which they were travelling. They leapt out of the vehicle, and fled the scene. The pair headed for the YDG-H barricades. Their route took them along Yenikapı Street – directly past the minaret, and the press conference. As they approached the scene, at least five of the policemen present at the press conference opened fire. In a little over nine seconds, 40 shots were fired. The brief shootout ended with only one fatality: Elçi lay dead at the feet of the minaret, killed by a single bullet to the back of the head. It was not only the manner of Elçi’s death – which recalled the execution-style killings of Kurdish human rights advocates, journalists and activists throughout the conflict’s worst years – that led many to claim he had been assassinated. In the weeks leading up to the press conference, he told Channel 4 News that he had been the target of numerous death threats. The threats followed a controversial appearance on a CNN-Turk talk show, in which Elçi claimed that the PKK – which for decades has engaged in violence against the Turkish security forces, and has been responsible for the deaths of many civilians – should not be considered a terrorist organisation. Elçi argued that a peaceful resolution of the conflict would require a recognition that the PKK, despite its documented history of violence, is primarily a political entity, with political demands, and with significant support among the country’s civilian population. Days after his statement, however, Elçi was detained on charges of disseminating terrorist propaganda, charges which carried a potential maximum sentence of seven-and-a-half years’ imprisonment. The Bar Association accused authorities of ‘criminalising free speech’, and called on lawyers, politicians and journalists to unite behind their chairman. When the news of his death broke, the threats and harassment that had followed Elçi’s appearance on CNN-Turk fuelled widespread suspicion that the state had been involved. Ahmet Şık, an investigative reporter previously jailed by the Turkish government, wrote on Twitter that “they chose to murder Tahir Elçi, instead of arresting him”. Mehveş Evin, a journalist and author, wrote that the incident reminded her of the 2007 assassination of the Turkish-Armenian newspaper editor Hrant Dink. Like Elçi, Dink was a progressive voice for minority rights who had experienced judicial harassment, and who had received numerous death threats in the months before his death. Dink was shot in the back of the head in Istanbul, outside the offices of the newspaper he had founded. In a public address on the day of the killing, Turkey’s Prime Minister, Ahmet Davutoğlu, pledged to apprehend the perpetrators, and promised that the state’s investigation would uncover the truth. Politically-motivated assassinations, he said, would not be tolerated. In his statement, Davutoğlu employed a Turkish shorthand – faili meçhul – that would have resonated with his audience. The phrase, which translates as “unknown perpetrator”, was used throughout the bloodiest period of the Turkish-Kurdish conflict, in the 1990s, to describe the state-sponsored, extrajudicial execution of Kurdish nationalists, journalists, and human rights advocates. Such killings often took the form of ‘a pistol shot to the head in a city street’, according to an Amnesty International report from the time. In these cases, the killers were routinely never found. Davutoğlu’s assertion that his government would not allow such killings to go unpunished was an explicit response to the gathering suspicion that Elçi’s death was another such case. On 1 December, Davutoğlu made a second public statement, in which he seemed to retract his suggestion that the killing could have been politically motivated. Rather, he insisted, Elçi would still be alive were it not for the shootings on Gazi Avenue, and that as such the two Kurdish militants, and the PKK as a whole, should bear responsibility for Elçi’s death. Hours after the killing, then-Justice Minister Bekir Bozdağ assured a press conference that the investigation into Elçi’s death would be conducted with the ‘utmost care’, but his department’s efforts were criticised from the moment they began. Amnesty International’s senior researcher in Turkey wrote on 30 November that the early days of the investigation hinted at a ‘cover-up’, while the People’s Democratic Party, or HDP, Turkey’s second-largest opposition party, suggested that the slow early pace of that investigation amounted to ‘paving a path to impunity’. A litany of process failures did little to allay these concerns. During autopsy, the wounds to Elçi’s body were cleaned before they had been adequately sampled and examined, according to Dr Ümit Biçer, an independent forensic pathologist commissioned by the Diyarbakır Bar Association to analyse the information passed to them by the public prosecutor. As such, potentially vital forensic evidence was lost. On the day of the killing, authorities failed to secure or process the crime scene due to ongoing clashes in the area, and when investigators returned two days later and began collecting evidence, their work was again cut short by security concerns. In his statement on 1 December, Davutoğlu blamed this failure to properly secure and examine the scene of Elçi’s murder on the PKK. Before they retreated, investigators gathered 43 pieces of evidence that had previously been identified and labelled for collection. Forty further pieces, from the area immediately around the base of the minaret, where Elçi was killed, were not collected. Photographs show members of the public walking through the crime scene, and handling pieces of evidence, leading members of the Bar Association to voice their concern at the early conduct of the investigation. The bullet that killed Elçi may have been among those pieces of evidence left at the scene – it was never recovered. It was only four months later, in March 2016, that investigators returned to carry out a two-day examination of the scene. The police officers who could clearly be seen firing their weapons in Elçi’s direction during the incident were never questioned as potential suspects, only as witnesses. Later in 2016, the Diyarbakır Bar Association commissioned Forensic Architecture to examine the evidence in their possession. That included witness testimony, video footage, photographs and material from the crime scene investigation, and official and independent reports. Our remit was to unpick the chaotic moments leading up to Elçi’s death. How many shots were fired? Was it possible to determine which was the fatal shot? Who could have fired it? By answering, as far as possible, these questions, and by identifying a range of possible perpetrators, we hoped to push the state to revive its own investigation. Among the evidence in the possession of the Bar Association were four videos that captured the scene leading up to, and after, Elçi’s death. Three were shot by journalists, and one by a police officer. When the incident began, each of the cameras turned toward the approaching runners, with the result that none of them were filming Elçi at the moment he was shot. In order to closely analyse every moment during the incident from as many angles as possible, we needed to synchronise the videos with one another. We did this by first comparing their sound signatures, and then by reference to the movement of individuals (and animals) that could be seen in multiple clips. Since none of the available footage captured the precise moment at which Elçi was struck, we had to approach the question of what happened in that moment by other means. We began by establishing what we called the ‘investigative time frame’: the period of time between the last point at which we see Elçi alive, and the first individual video frame – just over sixteen seconds later – in which Elçi’s body is visible. Since our analysis would be conducted at the level of individual frames – of which, in this case, there are 25 in every second of video footage – we began to refer to specific moments within the investigative time frame in a ‘seconds:frames’ format. For example 3:13 would mean 3 seconds and 13 frames. There are almost 7 seconds between the last gunshot recorded by the four cameras, and the first frame in which Elçi’s body is visible. Those 7 seconds, then, could be excluded from our inquiry, leaving us to examine an investigative time frame of exactly 9 seconds and 10 frames. With a time frame established, we counted every shot that could be seen and heard during that period, and noted the time at which each was fired. In those 9 seconds and 10 frames, a total of 40 shots were fired. Where we could see it in the video footage, we also made a note of who fired each shot, and in which direction. Where we could see the bullet’s point of impact, this was also recorded. Of those 40, we are able to identify 26 that were fired by police. The rest were only identifiable by the sound they made, and so it was not immediately possible to identify who had fired them. Fourteen of the shots fired during the ‘investigative time frame’ were not clearly captured by any of the four cameras. It wasn’t clear who had fired these shots, or in which direction. We refer to these 14 as the ‘unseen’ shots. 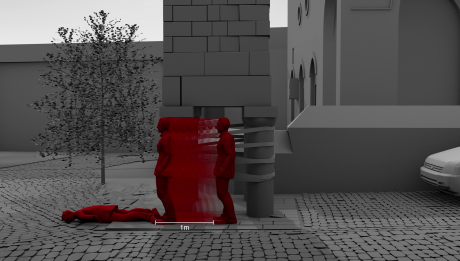 In order to better understand what was happening beyond the frame of the four cameras during the critical moment of Elçi’s death, we built a three-dimensional computer-generated model of the scene. Within it, we locate the four cameramen, the police officers, and the PKK militants. 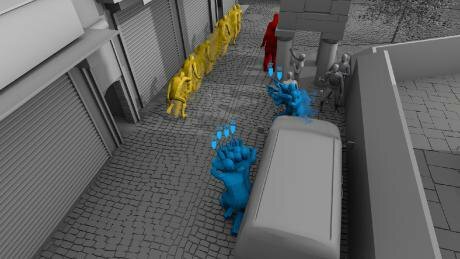 Using this model, we precisely reconstructed the trajectory of each person as they moved through the scene, the movement of each camera and their ‘cones of vision’, and, crucially, the approximate direction in which many of the shots were fired. A photo taken after the incident allowed us to establish the final position of Elçi’s body. Dr Biçer suggests that the fatal shot was fired from west to east along Yenikapı Street, and that as a result, at the moment he was shot, Elçi could have been standing up to a metre from where his body came to rest. Based on this information, we marked where Elçi could have been standing at that moment. Analysis of the footage labelled in our investigation as ‘Camera 2’ narrowed down the investigative time frame further. 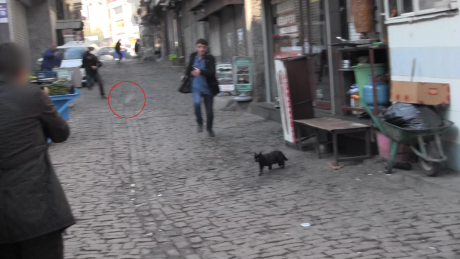 At one point, ‘Camera 2’ captures an area beside the legs of the minaret, through which Elçi would have to have fallen, had he been shot during that time period. However, Elçi does not appear in the camera shot. He must, therefore, have been hit before this footage was taken – almost 2 seconds before the final gunshot was heard. On this basis, we were able to reduce the duration of our investigative time frame: from 9 seconds and 10 frames, to 7 seconds and 12 frames. We could thereby also discount ten of the forty gunshots from our analysis, and reduce the number of ‘unseen’ shots from 14 to 13. Could the PKK militants have fired the lethal shot? On the day of the killing, Turkey’s Anadolu news agency, known to be close to the government, was quick to blame the militants. In the UK, Channel 4 News at first reported that ‘gunmen [had] targeted the press conference’, and that police were ‘too late’ to prevent Elçi’s death. On close inspection, however, nothing in the available video footage from 28 November 2015 suggests that the militants were aware of the ongoing press conference before the moment they turned into Yenikapı Street from Gazi Avenue. That day, the pair, later identified in Turkish press as Mahsun Gürkan and Uğur Yakışır, had been followed by police from the funeral of another young militant, their cousin Süleyman Yakışır. When they arrived on Gazi Avenue and noticed the approaching officers, Gürkan and Yakışır opened fire, killing two policemen. They exited the vehicle, and fled toward the barricades at the eastern end of Yenikapı Street – running directly into Elçi’s press conference. The next stage of our investigation, then, was to examine whether any of the 13 remaining ‘unseen’ shots could have been fired by Gürkan (labelled ‘Runner 1’ in our investigation) or Yakışır (‘Runner 2’). We examined the movements of each militant at the moment that each of the ‘unseen’ shots was heard, closely studying their body position, and the way they held their guns. The results of our analysis confirm with near-certainty that neither of the PKK militants could have fired the shot that killed Elçi. In fact, for much of the time frame during which Elçi was hit, Gürkan was clearly holding his gun by the barrel, and thus unable to shoot. Yakışır does not appear to aim at Elçi at any point during the time frame, and eventually throws his gun at the police. In fact, it seems very likely that Yakışır fired at least once while on Yenikapı Street. According to police testimony, he fired at a police officer (labelled in our report as police officer A), wounding him in the lower abdomen. While we are unable to clearly identify any specific shots fired by Yakışır from the available video footage, police officer A does appear to collapse to the ground, as if shot, shortly after Yakışır passes him. Around a year later, Yakışır himself confirmed in an interview that he had fired at the policeman. Gürkan was reportedly killed by Turkish security forces in Sur in March 2016. Six of the policemen who were present on the scene that day testified that they heard long-range weapons being fired from the direction of the barricades at the eastern end of Yenikapı street, while the PKK militants ran through the press conference. If this claim were true, it would suggest that unknown members of the PKK or YDG-H, shooting from behind the barricades to the east of the minaret, were responsible for the killing. The report of the crime scene investigation from March 2016 concluded that the fatal shot could have come from any direction, and could have been fired from any type of weapon. We examined those testimonies thoroughly. In three of the six, the way that the witness has described hearing ‘long-range weapons’ is written identically, word-for-word. Between all six testimonies, a shorter phrase is repeated identically. This repetition could suggest a coordinated effort to implicate members of the YDG-H, or at least to create further uncertainty around the killing. Two other officers claimed they also heard long-range weapons, but only after the militants had left the scene – which, our analysis shows, was after Elçi had been fatally shot. We examined the audio profiles of each piece of footage, looking for an indication that any of the 30 shots that could have struck Elçi had been fired by a weapon of a different caliber, or from a notably different distance from the camera. 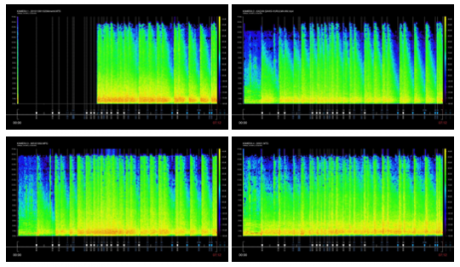 Our analysis was based on creating spectrograms from each recording. A spectrogram is an image of the frequencies that make up a particular piece of audio, and describes how those frequencies change over time. Upon examination, none of the 30 shots fired had an audio profile that stood out from the rest. We knew that 17 of those audio profiles were the result of a handgun, so only an audio signature that was substantially different from those would suggest that the sound of a long range weapon had been recorded. The location of Elçi’s body, and the nature of the injuries he sustained from the gunshot and the subsequent fall, cast further doubt on the ‘long-range weapon’ hypothesis. Dr Biçer’s independent report concluded that the fatal shot had to have been fired from west to east along Yenikapı Street. However, the YDG-H barricades, from where six policemen recalled hearing a shot, lay to the east of the press conference. As a result, we consider the ‘long-range weapon’ hypothesis to be very unlikely. Could the police have fired the lethal shot? Our investigation so far had led us to conclude that the PKK militants could not have fired the shot that killed Elçi, and that there is no evidence that he was killed by a long-range weapon. This process of elimination suggested that one of the police officers who fired their weapons during the incident could have been responsible for the fatal shot. The public prosecutor’s case file contains witness testimony from 26 police officers. In addition to the five seen in the video footage, two other officers testified to having fired their weapons during the incident. These shots likely account for at least some of the ‘unseen’ shots. We started by examining whether any of the five police officers who we can see firing their weapons during the incident had a direct, unobstructed line of fire to Tahir Elçi at the moment they are shooting and could have thus fired the lethal shot. Given that even very small changes in the orientation of the handgun would substantially vary the likely point of impact, we were conservative in our approach to the possible lines of fire of the policemen. Within our digital model, we drew a broad ‘cone of fire’ from the shoulders of the police officer in question to the edges of the area in which, according to Dr Biçer’s report, Elçi could have been standing at the moment he was shot. We eliminated from our inquiry every shot which had been fired during the investigative time frame without a direct line of sight towards Elçi’s likely location. Six shots remained. Based on our analysis, we concluded that police officers A and D had direct but partially obstructed lines of fire towards Elçi during the period in which they are visibly firing their weapons. Either could therefore have fired the fatal shot. Police officer C is the only officer to have had a clear unobstructed line of sight towards Tahir Elçi, during the period in which he fired shots 24, 26, 28, and 29. He too could have fired the fatal shot. The fact that the police had fired so many shots at the militants, at such close range, without hitting either of them, fuelled rumours on social media that the entire incident had been staged, and that the police had been firing blanks at the pair, as cover for the killing of Elçi. Our analysis identified impact damage and bullet holes which confirm that ammunition was live, rather than blanks. According to this account, Elçi was hit about 4.5 seconds into the investigative time frame. Eliminating the period of time before Uğur Yakışır (Runner 2) throws his weapon from our inquiry excludes a further 20 shots, and reduces the time period in which Elçi was shot to exactly 2 seconds and 20 frames. By now, only ten gunshots remain within the investigative time frame, nine of which were visibly fired by police. We modelled this time period in detail. As Yakışır passes by police officers C and D, the cameramen, and Elçi, he draws the lines of fire of the two officers toward Elçi. The camera also turns clockwise to follow him – though not fast enough to capture the moment that Elçi is struck. As he runs, Yakışır’s trajectory draws the aim of both of the officers toward Elçi, and their lines of fire begin to converge on the lawyer’s position. According to our analysis, one of these two officers likely fired the fatal shot that killed Elçi. 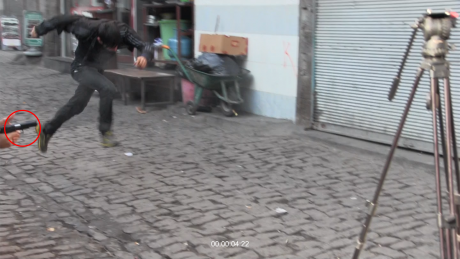 Police officers C and D can clearly be seen firing in the direction of Elçi, and should be considered suspects in his killing. Seconds earlier, police officer A also had a line of fire towards Elçi, though partly obstructed and at a greater distance. He should also be considered and questioned as a suspect. Was Elçi given medical attention? Following the shooting, one of the four cameras continued to record for around 13 minutes. Throughout this time, as shots rang out intermittently from nearby streets, Elçi’s body lay on the ground unattended; nobody in the vicinity attempted to check his condition, or to give him medical attention. Almost immediately after the end of investigative time frame, an officer speaks into his radio that a person is wounded. Four minutes later we hear sirens, and people shout, as if hailing an ambulance. Ten minutes after the second militant has left the scene, with security forces still moving cautiously, as if expecting to come under fire from the nearby barricades, a police officer walks over to Elçi’s body. He does not appear to check on Elçi’s condition. 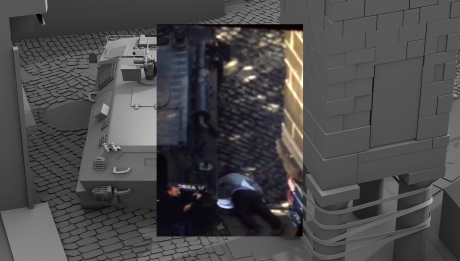 Around 90 seconds after that, the camera captures the injured police officer A being evacuated from the scene, and a minute after that – 12 minutes and 30 seconds after the end of the investigative time frame – an armoured vehicle arrives, parking just centimetres from Elçi’s body. Shortly afterward, the camera stops recording. Elçi had used his final press conference to call for an end to conflict in the historic district of Sur. Instead, his killing marked the beginning of its escalation. Four days later, the military curfews that had been a feature of life in Sur since September became a permanent siege, as Turkish security forces surrounded and sealed off access to the neighbourhoods barricaded by the YDG-H. Tens of thousands of civilians were confined to their homes, many without access to water or electricity. A round-the-clock curfew was enforced by snipers and armoured vehicles. By the time the siege was lifted in March 2016, more than 200 people had been killed, according to NGOs and humanitarian monitors, and bodies lay in the streets for weeks. Eight hundred buildings were destroyed during the siege – 80% of a district that had been continuously inhabited for 7,000 years. The walls of the mosque outside which Elçi was speaking were partially demolished, to make it easier for armoured vehicles to pass through Yenikapı Street. The curfew in Sur was one of a number enforced across the region. According to the Turkish government, they were intended to root out militants and restore order in the restive cities and towns of Turkey’s Kurdish-majority region, including Cizre, İdil, Nusaybin and Silopi. But with 200,000 civilians under siege, they quickly became humanitarian disasters, according to NGOs and monitors in the region. Turkey ignored a request by the UN’s high commissioner for human rights in May 2016 to allow its staff to investigate allegations of human rights abuses in the region. More than three years after his death, the question of who killed Tahir Elçi remains unresolved. Our investigation, however, points to some clear next steps. At a very minimum, police officers A, C and D should be considered and questioned as suspects, and their actions investigated as such. It is quite possible that the killing was an unintentional consequence of the firefight. However, the way it unfolded, and Elçi’s place within the long history of conflict in that region, make it inevitable that questions and suspicions will always surround the incident. A thorough, effective and transparent investigation by the public prosecutor is urgently necessary, not only to meet and do justice to those questions, but to discharge the most basic responsibility of the Turkish state towards its citizens.